As I explained the other day, the idea that government should provide "economic development" is both intellectually ridiculous and economically dangerous. Yesterday I offered an example of "economic development" disasters in the form of Tesla Motors. Corporate welfare, which is really what "economic development" is all about, comes in many different forms. Regardless of whether it is about playing favors with specially carved out tax breaks, subsidies or risk-neutral loans, the purpose is always to provide some businesses with money that their competitors cannot get access to. In addition to abusing the taxation power to pick winners and losers, government also distorts the private venture-capital market with its favoritism. When government gives one business a financial edge over its competitors, the risk that private investors take is artificially reduced. More investors flock to government's favored company than otherwise would be the case. What government gives, government can also take away. Once the corporate-welfare faucet is turned off, a favored business is more likely to go under than a business that has come about, survived and grown on its own. When the favored enterprises do go under, they pull with them a disproportionate amount of private capital that otherwise - without the distortionary effects of corporate welfare - would have provided support for successful ventures elsewhere. Despite these obvious facts, our politicians keep throwing corporate welfare after their favored businesses. The motive is often that we need industrial diversification, especially at the state level. Therefore, we will take a look at precisely that issue - industrial structure - to find out what the U.S. economy really looks like. In 2000, the diversification had gone even further: TTU (23.8), government (19.0), manufacturing (15.8), professional and business services (15.4) and leisure and hospitality (11.3). 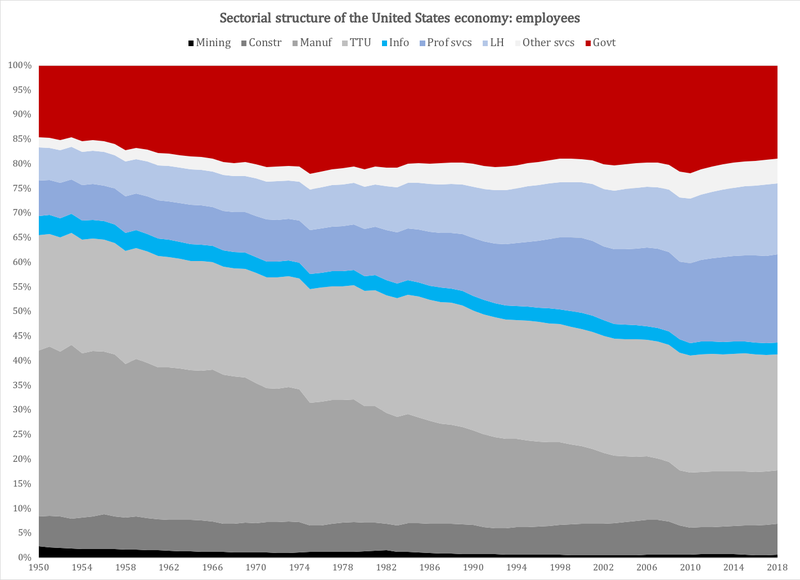 By 2010 the Great Recession was in full force, but it is nevertheless interesting to note that by then, manufacturing had declined to 11.2 percent of the workforce, ranking the industry fifth after TTU, government, professional services and "tourism". Since then, the manufacturing share has stabilized around eleven percent, with very recent signs of an uptick in the making. As of June 2018, the only industry that employs more than one fifth of the workforce is Trade, Transportation and Utilities (23.6 percent). We then have four industries between 10 and 20 percent: government (18.9), professional services (17.9), leisure and hospitality (14.4) and manufacturing (10.9). Four others dwell between zero and ten: construction (6.3), other services (5.1), information (2.4) and mining (0.6). Plain and simple: our economy has never been more diversified than it is today. There is another aspect to industrial diversity, namely the value of production, or the distribution of GDP over industries. This is important because GDP is the broadest possible tax base; a recurring argument for "economic development" at the state level is that there is a need for a broader tax base. Therefore, the next article will examine the industrial structure of our states, from the perspective of GDP-defined production value. In short: how industrially diverse are our states - really? Is there a need for corporate welfare in order to diversify our states' economies?